Carrying well-chosen trail recovery gear among your Wrangler’s equipment ensures you successfully complete your off-road adventure. Some off-road spots can trap a Jeep – including deep mud, obstacles, steep slopes and stream beds. Rather than walking for hours before reaching a road and then spending considerable amounts of money and additional time retrieving your Wrangler, having winches, shovels and other recovery tools on board enables extracting yourself from difficulties. This satisfying, practical self-reliance quickly frees your JK for more thrilling cross-country action. Lift kits, light bars and custom paint all make a Jeep Wrangler unique, but don’t forget the wheels. If you really want to customize your ride, drop the stock and add an aftermarket rim like those from Mammoth. Extreme Terrain is pleased to announce 6 new rims for 2007-15 Wrangler JK models. Here is what you need to know. When customizing your Jeep it is the little details which will set it apart. High quality and unique modifications is where our line of Daystar parts comes in. From hood vents, switches, and gas can kits, we carry every Daystar part you need. One of the first upgrades Jeep owners make to their Wrangler are bumpers and Barricade offers some of the best options when it comes to off-road ready bumpers and equipment. Barricade Cargo Nets: Available Only at ExtremeTerrain.com! 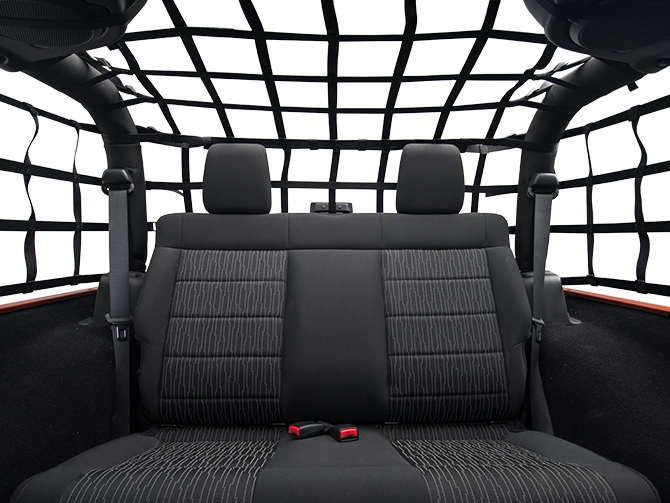 Barricade Cargo Netting will add rugged good looks as well as function to your Jeep Wrangler. Whether you’re keeping cargo in the Jeep on rough trails or pets safely in their place, these nets perform many functions!